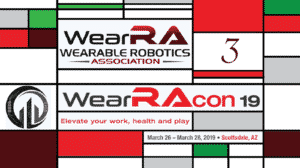 In addition to all of the panels and demos, the Wearable Robotics Association Conference 2016 also featured the WearRAcon16 Innovation Competition. 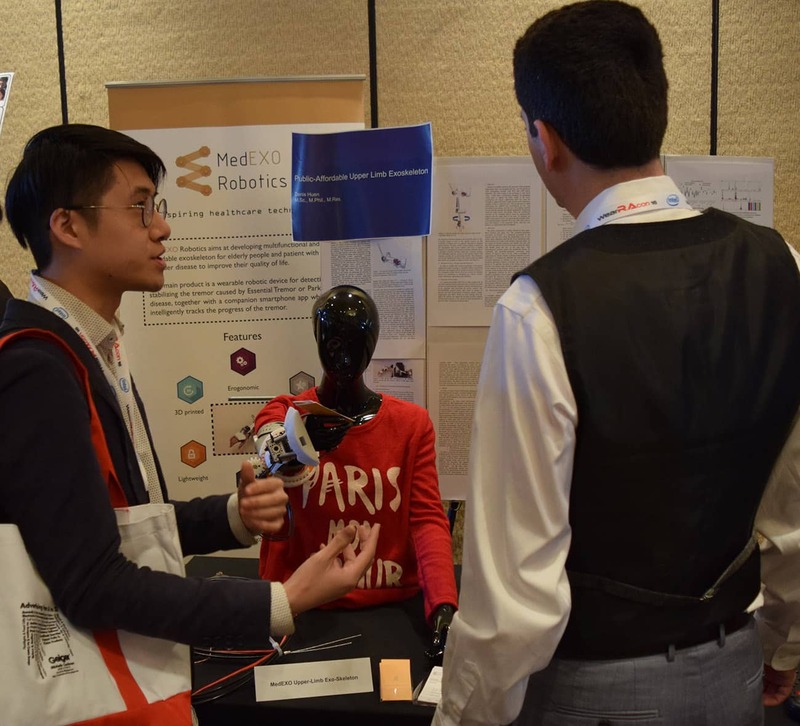 Researchers had a chance to submit a project that directly impacts wearable robotics technology. Prior to the conference, each group entered a 1 minute video. 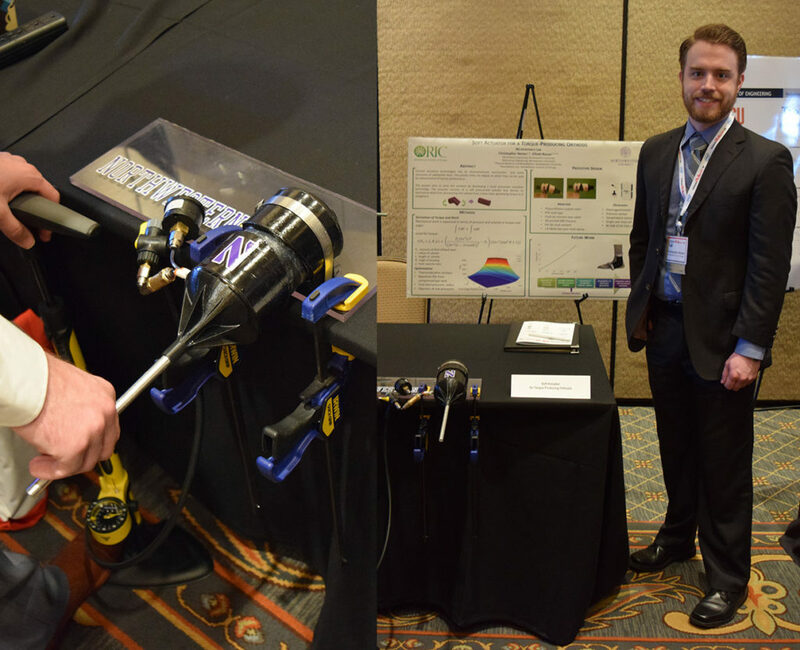 The members of the top 10 projects were invited to present at WearRAcon16. 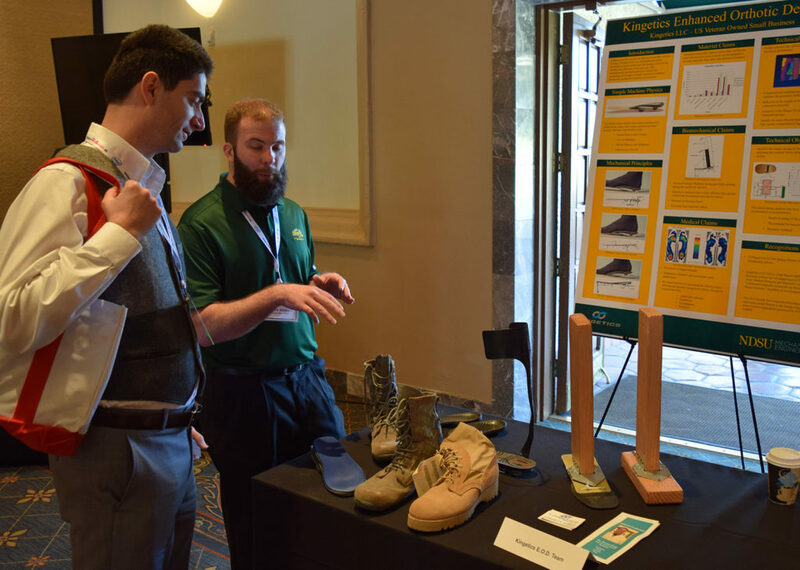 Each of the top groups brought posters and prototypes which were on display for the duration of the entire conference. 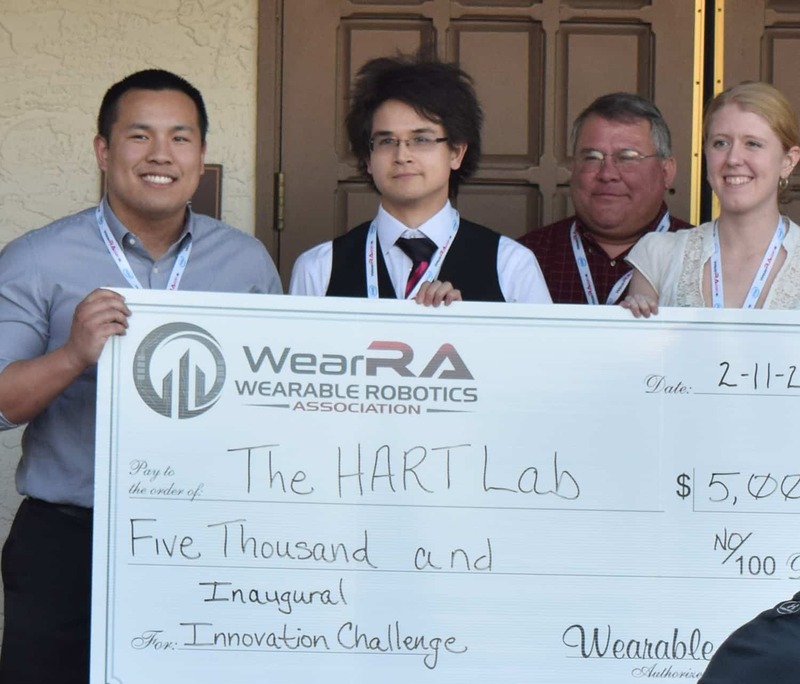 Professionals, academics and customers in the wearable robotics industry mingled with the project presenters and ultimately voted a winner. The winning group received both recognition and a cash prize of $5000. Over the last few years there have been produced quite a few boot imbedded devices that aim to produce or recover energy while walking. The main target is usually the heel strike, with an elastic element that compresses to either generate or store energy. The device by Dr. Steven King has a new approach: a lever insole. The wearer steps as normal, but as they prepare for their next step and transition their body weight over the foot the heel is lifted by the orthotic device in a controlled lever ratio. This is in addition to the insole being elastic and still able to generate or store energy at heel strike. This a very different take on energy optimization compared to other boot inserts. This is still in early development and there still aren’t any controlled studies to show the change (if any) on metabolic rate while walking with the Spring Orthotic Device. This was the first time the ExR team has seen any of the work by the HART Lab at UC Berkeley. Normally, UC Berkeley is associated with the work of US Bionics/Suit X, Ekso Bionics and the lab of Professor Kazerooni. 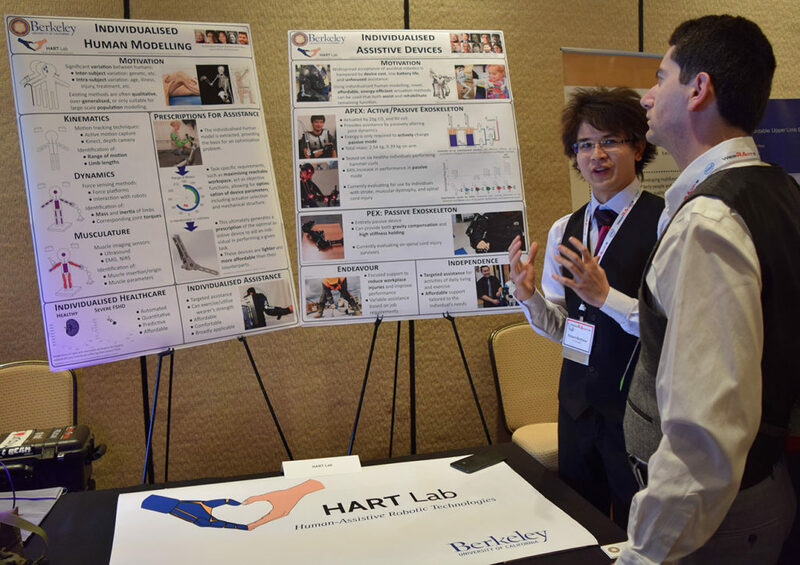 Apparently, there is so much interest in exoskeleton technology at UC Berkeley that there is at least one additional lab, the Human-Assistive Robotic Technologies (HART) Lab. At this point it has become clear that one exoskeleton will not fit all people and needs, even with adjustable straps and frame length. But how much customization is needed? Would adjustable components be enough to encompass a large enough percentage of potential customers for an orthotic product? Would it help to have an exoskeleton be modular? Or in the most extreme case, should exoskeletons be completely customizable and made to order? The HART Lab members are busy answering all of these questions. In addition, they are also creating standardized methods for testing exoskeletons and modeling muscle deficiency due to sickness or injury. The work of the HART Lab specializes in upper body devices. It could prove to be instrumental for the commercialization of exoskeletons in all subfields of the exo industry. Featured above is a fully operational inflatable designed to produce torque. Inflatable actuators and inflatable exosuits have been a very hot topic over the last year. Otherlab Orthotics, the Wyss Institue and Daiya Technologies are just some of the many companies and labs that are working on inflatable robotics. Exoskeleton Report alone has 10 articles with the key word “inflatable.” Even so, this was the first time I have seen a functional inflatable actuator. The manual pump provided the needed compressed air while a switch was used to quickly deflate the actuator. It was really interesting to be able to personally experience and test the system. As other people have noted, air muscles take a while to inflate, and the overall compartment is large, but it does provide a lot of force with air under 20 PSI. In the future I would expect to see a lot more inflatable exoskeletons. There are multiple companies that are working to reduce the size of the air compressors needed to power such a wearable and to increase the actuation speed. It was very thoughtful of Northwestern University to bring a working example. Don’t be surprised if the Cooler Suit looks familiar to you. A version of it can be seen in last year’s promotional video for the Kinetics Operations Suit by Revision Military. The Cooler Suit acts like a wearable air conditioner. It circulates cooled water using a water pump through thin flexible tubes sewn onto the user’s clothing. The cold fluid brings the body temperature down and the liquid is cooled again once it returns to the backpack portion of the device. Some people refer to the Cooler Suit not as an exoskeleton device but as a “dermal suit.” In my opinion, it is very much an exoskeleton as it “applies robotics and biomechatronics towards the augmentation of a human.” There are sensors that monitor body temperature, a pump, and a cooling component all united by a controller. Regardless if it is a true robotics device or not, it is a very interesting wearable. Devices similar to the Cooler Suit are already used in Hollywood to keep actors wearing full body costumes from overheating. The military is also interested in using a cooling wearable for soldiers, especially in hotter countries like Afghanistan and Iraq. Reportedly, some areas with US military activity can get so hot that foot steps will leave imprints in the asphalt. Looking further ahead, cooler suits could be used for a variety of industries, especially farming where workers have to be outside in the heat for long periods of time. The current version of the Cooler Suit that was brought to WearRAcon16 was a prototype and a proof of concept. It will clearly not fit comfortably underneath a soldier’s armor and backpack. If there is interest (read investment money) newer models can be significantly miniaturized. A similar technology, water cooled computer CPUs and video cards, has gone through years of improvements and refinements before becoming adopted by gamers and other high-end computer users. Up until a few years ago, tremor suppression was one of the most promising applications for which exoskeletons could become commonly used. A person that suffers from tremors experiences sudden, repeatable back and forth movements in a limb. Research has shown that physical suppression of the tremors using an opposing force trains the brain. With time tremors become smaller in magnitude and have fewer occurrences. Exoskeletons used for early experiments were all stationary medical devices. As exo technology improved, tremor suppression fell off the radar as a “hot” application and few mobile exoskeletons for tremor suppression were developed (as a side note, the most recent tremor suppression exoskeleton that I have seen was used to train soldiers to shoot guns more accurately). With the decrease in cost of sensors and other electronic components, the MedEXO Robotics team has decided to revisit tremor suppression. Is it now possible to have cheap, well fitting exos that are just powerful and accurate enough for this application? 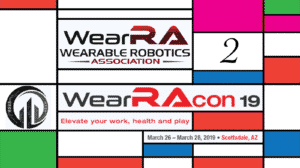 The prototype brought to WearRAcon16 was definitely rough around the edges, but it was a mobile device that meets a real life need and can be turned into a product after a few revision iterations. 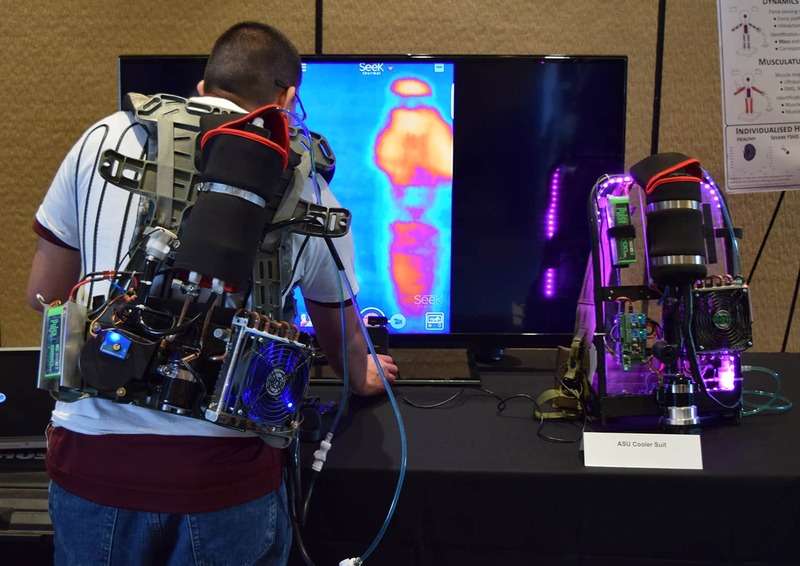 At first glance, the Hip Actuating Exoskeleton for Running Assistance may not look like much, but it is a truly interesting project for two main reasons: First, this exoskeleton turns a decade of military wearable robotics research upside down. Military exoskeletons started with heavy, complicated wearable devices that tried to do everything. They were all a failure. Over time, exoskeleton developers have slowly simplified military powered suits layer by layer, reducing the number of motors and frame components. The Hip Actuating Exoskeleton takes the reverse approach. It begins with the simplest configuration its designers could think of. One motor provides the force to move the leg forward while a mechanism pushes the other leg back (still using the same motor). The force is then transmitted to the legs in the most straightforward, minimum parts way possible. This is the first serious, powered exoskeleton project that I have seen that has only a single motor. 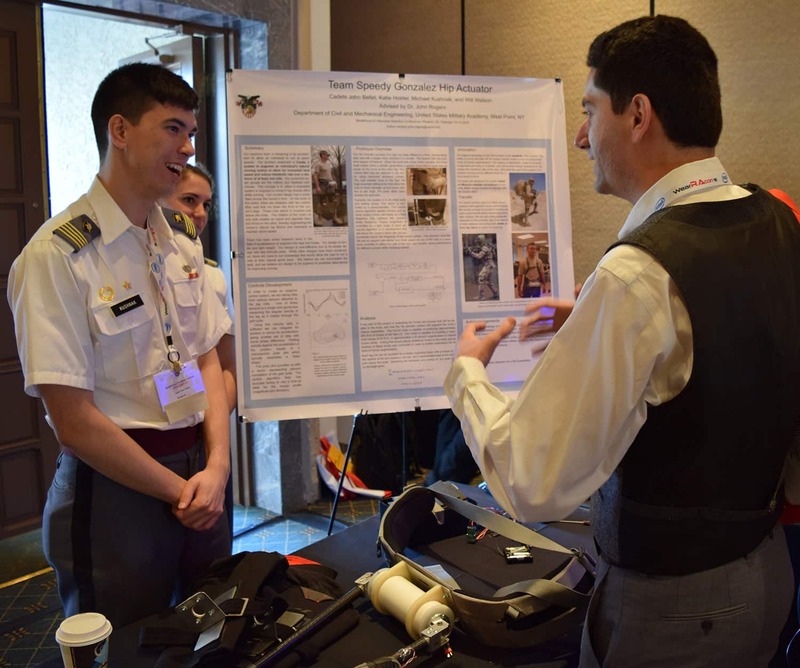 A design that started from the simplest possible solution will create a great baseline for the more complex military exoskeletons currently in development. The second feature that makes this project unique is that it is designed by the military for the military. Right off the bat you probably noticed that the exoskeleton mechanism is in the front, and not on the sides of the hips and legs as every other device out there. The military is not happy with exoskeletons that are off to the side because they interfere with standard weapons use and combat. Over time, who knows what other built-in features the developers from West Point can integrate into this exoskeleton. Above are only some of the projects entered for the competition. 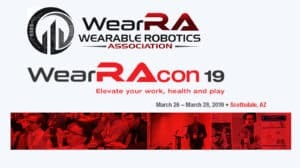 If you would like more R&D projects or information on the ones featured here, you owe it to yourself to visit the WearRAcon16 Innovation Competition Submissions Page: http://www.wearablerobotics.com/view-submissions/ There you can find one minute videos of the projects presented in this article as well as the ones we just didn’t have time to cover such as the “World Window” – a wearable device for recording a person’s surrounding environment. 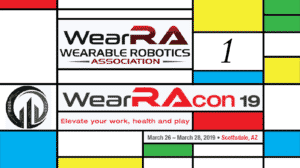 Special thanks again to the Wearable Robotics Association for organizing WearRAcon16. It was a phenomenal event and 3 months later the ExR team is still trying to report on everything that we saw! 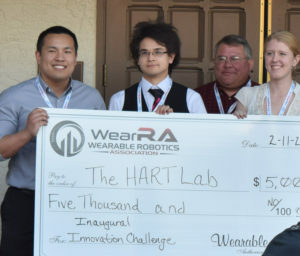 The HART Lab, UC Berkeley proved most popular with attendees and was the winner of the WearRAcon16 Innovation Competition! Congratulations to the entire team! Expect to see a lot more exciting work from them in the future!